P110LF-SS is rated 5.0 out of 5 by 3. Rated 5 out of 5 by Honeygirl from Great for the Price! Only purchased a week ago, and so far I am pleased! 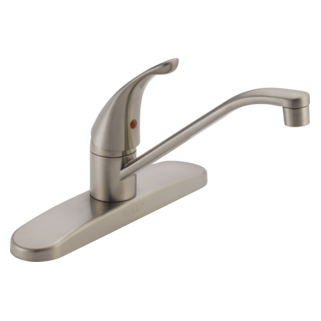 Rated 5 out of 5 by fergi from great faucet very happy with this faucet. had just installed a delta from a big box store and could never get appreciable flow out of it as we have about 30 psi water pressure. damaged new delta trying to make it work so was very pleased with this peerless heavy duty item. purchased from childers hardware in Versailles il. Rated 5 out of 5 by ArizonaflagmanDOTcom from Bought Peerless 16 years ago, replaced with a new one today Have always been satisfied with Peerless fixtures, commercial and residential. 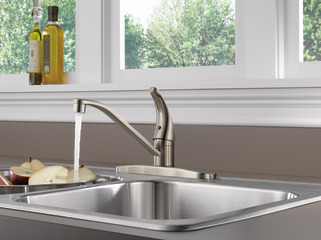 Moen is nice to, but the Value of Peerless is worth the less exspence. I need to replace the set screw on my p110lf faucet. What is the size of the set screw? What size set screw wrench to I need to take handle off? Is the P110LF-SS faucet the same as the P8500 series? Thank you for your question. The sku number for the ball assembly on the Peerless Faucet is model # RP44123.